HONG KONG - U.S. 7th Fleet flagship USS Blue Ridge (LCC 19) arrived in Hong Kong for a port visit during its 2016 patrol season April 29. The Blue Ridge team, consisting of more than 900 members, including embarked 7th Fleet staff, Marines from Fleet Anti-terrorism Security Team Pacific (FASTPAC) and the “Golden Falcons” of Helicopter Sea Combat Squadron 12 are currently on patrol in the Indo-Asia-Pacific strengthening and fostering relationships in the region. During the visit, Blue Ridge Sailors will volunteer within in the local community through two community service projects and various band performances. 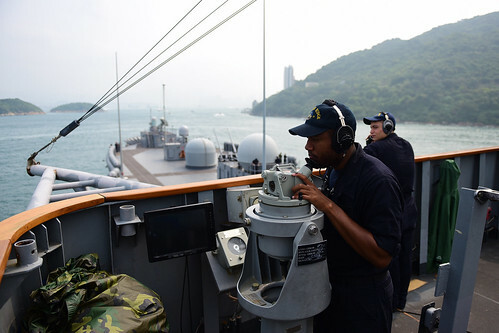 USS Blue Ridge last visited Hong Kong, 20 March 2015. Local families in Hong Kong will also host Sailors and Marines at their homes or provide for them a personalized tour, showing them around the city through the Meals in the Homes program. Blue Ridge’s Morale, Welfare and Recreation (MWR) committee also organized other tours providing Sailors and Marines a the chance to experience the history and culture of Hong Kong more intimately. “These tours offer Sailors a chance to see and discover aspects of the local history that they might not have found on their own,” said Hospital Corpsman 1st Class Anika Miller, Blue Ridge’s MWR coordinator.